The year 2017 is ending for ALHAMBRA INTERNATIONAL and I thank you for your loyalty. This year 2017 has allowed us to consolidate our development on Continental Europe, especially in Benelux and in Germany and to develop our presence in Asia Pacific. Thanks to our existing partnership in Singapore since nearly one year, we could carry out several assignments in South East Asia, especially in Vietnam and in Thailand for European or Asian clients with a strong international presence. Continental Europe remains our main source of growth with Germany and Benelux which are full employment countries for Executives and Top Managers. Our assignments were diverse in Europe this year and mainly focused in the food processing industry, capital goods, real estate, logistics and supply chain with recruitment in Human Resources, Safety Food / Microbiology, Research and development in Cosmetics area, Financial reporting and Key Account Management. France was dynamic in the services sector, one of the strengths of its economy including assignments in early childhood services and cleaning and sanitation services for cities. Scandinavia, the United Kingdom, Eastern Europe and the Middle East are also geographical areas that we develop on an ad hoc basis. Industry is one of the mainspring of this existing and future growth in Europe and also in other continents; it is also a fast-changing environment with the development of robotization, automation and now artificial intelligence. The European companies are well prepared on B to B markets as shown by the announcement of the recent merger between Thales and Gemalto. It will allow them to create one of the global giants of cybersecurity and strengthen them in more and more digital markets (including the Internet of Things). This is the successful alliance between a famous industrial company and a High-Tech leader to handle the chain of interconnected technological objects (airport security, air traffic management, communication of advanced combat systems, connected cars …). These alliances will multiply tomorrow and we can also mention those of car manufacturers and pick up services companies (VTC) to support the transformation of the automotive market into mobility services. We have been preparing for this convergence for several years by working for industrial companies of similar size, which allows us today to be very well positioned in the industry field. The launch of our Assessment services as part of our Leadership Consulting department is now completed with an individual Assessment offer for Executives and Managers in the context of an external recruitment or an internal promotion and a Team Assessment offer to improve the overall performance of a team as well as coaching services. Assessment services are carried out with market tools that allow people to be compared with similar profiles and proven methodologies. Alhambra International associates the best experts on the market to its team of consultants. Our interactions with recognized professional organizations continue to demonstrate our commitment to integrate our activities with changes in corporate governance, in order to take into account diversity, independence and parity. The year 2017 also brought us additional satisfaction, again with the presence of Alhambra International in the ranking of the most recognized companies in the magazine « Decideurs », particularly in the following categories: Industry, High Tech & Digital, Middle and Top Management and International…. These distinctions were won thanks to you again. In 2018, we also plan to reinforce our presence in Asia Pacific, particularly in Hong-Kong and in mainland China which have increasing needs for Executives educated in the best international universities, with multi-continents’ experience. Asian economic giants continue to emerge alongside the Chinese GAFA well known under the name of BAT (Baidu, Alibaba, Tencent). These giants evolve in the following sectors: the electric motor cars and the batteries with BYD, ZOTYE, CATL or LISHEN, the high-speed trains with CRRC (China Railway Rolling Stock Corporation), the future competitor of the new European ALSTOM / SIEMENS Group or planes with C919, Chinese equivalent of Airbus A320/ Boeing 737 produced by COMAC. Our recent assignments and extended network in Asia Pacific have allowed us to enrich our knowledge of Asian economies and to identify points of convergence and differences with major European economies. As you can notice, the global economy is changing very quickly today, industry leaders are partnering with startups and also with high-tech leaders in order to win new markets and to remain competitive. Our clients have global needs in Executive Search and in Leadership Consulting on several continents mainly in three regions: Americas, EMEA, Asia Pacific. We have decided to focus on the EMEA and Asian regions to provide outstanding services thanks to our consultants and specialists handling cultural, geopolitical and economic aspects in these areas. 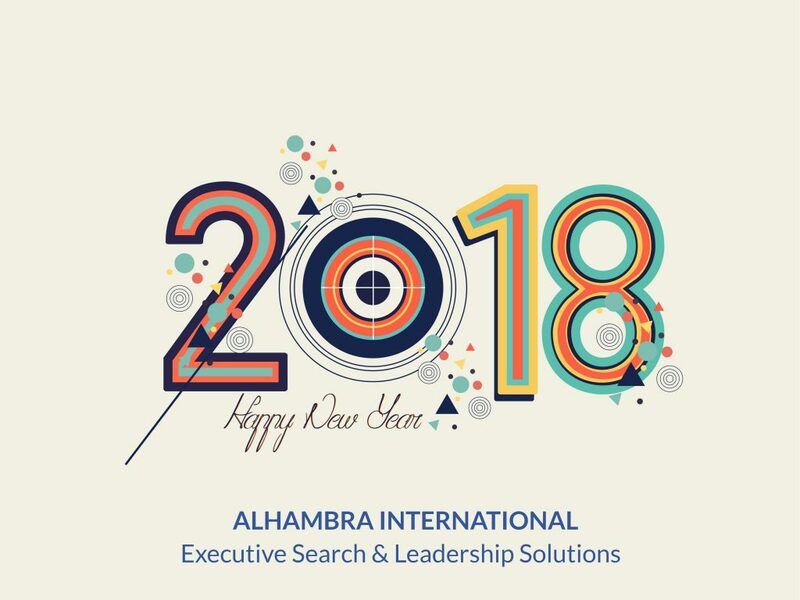 I wish you, on behalf of the entire Alhambra International team, a very happy 2018 year full of health, happiness, prosperity and growth!